Natural Health News — The neonicotinoid pesticides (or neonics) used widely by farmers are implicated in collapse of bee colonies, say US scientists. Neonics, like many pesticides, work by damaging the nervous systems of insects Pesticide manufacturers have long claimed that neonics are safe, that bees exposure to them is limited to the spring planting season, and that banning them is not only unnecessary but would harm their multi-billion pound industry. However a recent peer-reviewed Purdue University study, published in the online edition of PLosONE, shows that honey bees’ exposure to nicotine-based neonics is higher than previously thought. 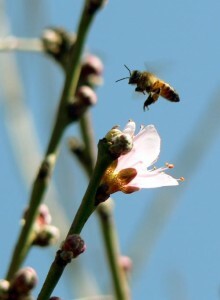 The researchers specifically looked for the pesticide clothianidin one of the most widely used neonics. It is absorbed by a plant’s vascular system and released through pollen, nectar and other fluids produced by plants from which bees forage and drink. Clothianidin is most commonly used as a seed treatment, but says the study, it is also released as a dust into the atmosphere by the tractor-drawn planters used on farms. This means that bees can be exposed both through contact and ingestion, and also that exposure to the pesticide is more prolonged than previously thought extending from the early spring planting season right through the late summer. The scientists used sophisticated technology to analyse the pollen from test treated maize plants and the soil the plants grew in to better understand the insects’ real world exposure to clothianidin. They also measured levels in the plants on the margins of test fields, such as dandelions, as well as levels in the wax in side the hives and in dead bees from hives that had collapsed. Nearly all of the samples they examined contained high levels of clothianidin and in some cases another common neonicotinoid, thiamethoxam. They also contained mixture of other pesticides and fungicides known to enhance the toxicity of neonics as well. Many of the samples contained levels of clothianidin that were greater than the acknowledged lethal dose. The researchers note that the effect of using neonic pesiticides is not is not confined to local bee hives. They are also a danger for migratory colonies (bees transported around the country to pollinate winter-flowering speciality crops in western North America, such as almonds and other fruit and nut crops). Clothianidin, which has been on the market since 2003, can remain in soil for a long time and commercial beekeepers are concerned that even an immediate stop-use of clothianidin won’t save their livelihoods or hives in time. Nevertheless a ban, is the only things that may save bees and other essential pollinators moths and hoverflies over the longer-term. Although neonicotinoids have faced bans or restrictions in Germany, France, Italy and Slovenia, regulators in the UK and the US have so far accepted the industry’s contention that the toxins were not poisoning bees. While big business continues to protect its own short-term best interests, the US has been losing one-third of its honeybee hives every year, while beekeepers in Europe say that more than one million bee colonies have been wiped out in France, Germany, Italy and the UK since 1994. Honeybee deaths – beyond pesticides?